Why are the distances in the previous problem not exactly additive, e.g. why is the distance between the outside markers (A and B) not 35 map units (or 35% recombination)? There are several possible explanations, and this problem explores the effects of multiple crossovers. The basic idea is that the further apart two genes are, the more likely that recombination can occur multiple times between them. 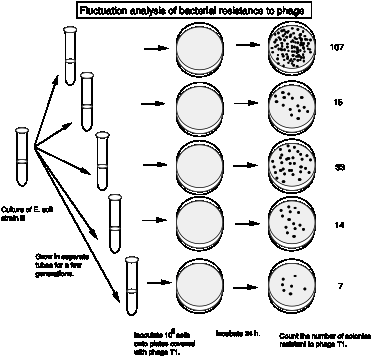 Of course, two (or any even number of) crossover events between two genes will restore the parental arrangement, whereas three (or any odd number of) crossover events will give a recombinant arrangement, thereby effectively decreasing the observed number of recombinants in the progeny of a cross. One of the classic experiments in bacterial genetics is the fluctuation analysisof Luria and Delbrück (1943, Mutations of bacteria from virus sensitivity to virus resistance, Genetics 28: 491-511). These authors wanted to determine whether mutations arose spontaneouslywhile bacteria grew in culture, or if the mutations were inducedby the conditions used to select for them. 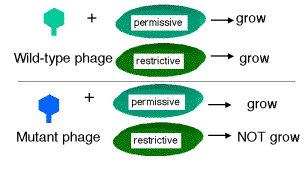 They knew that bacteria resistant to phage infection could be isolated from infected cultures. When a bacterial culture is infected with a lytic phage, initially it “clears” because virtually all the cells are lysed, but after several hours phage-resistant bacteria will start to grow. a. What are the predictions for the distribution of the number of resistant bacteria in the two models? 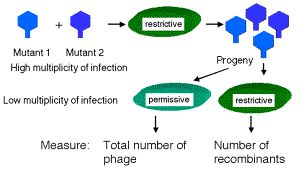 Assume that on average, about 1 in 107 bacteria are resistant to infection by phage T1.